The first day in the high mountains of this year’s Tour de France was the initial showdown for the GC contest. The four long Alpine climbs and a stiff headwind on many of the mountains left the GC group to neutralize itself between episodes of aggressive racing. Nonetheless, the pace set by Team Sky made it a hard day out. The stage ultimately belonged to Frenchman Julian Alaphilippe, who dominated the early break for a fantastic solo victory. 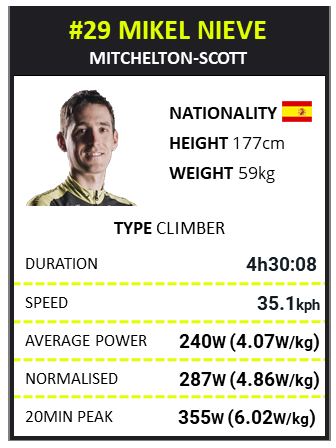 We have Mikel Nieve of Mitchelton-Scott GreenEdge to give us full analysis from his data on today’s stage. We also have some additional insight from Tom-Jelte Slagter of Dimension Data for Qhebeka, who was in the lead break for most of the day. Mikel Nieve is the key domestique to team leader Adam Yates in the high mountains. In today’s stage we see exactly why he has that role—he stayed with the select group on GC favorites, keeping Adam to the fore when the pace was set high on these long climbs. Mikel is known as one of the best-climbing domestiques on the planet, and can take wins in this sort of terrain, as we saw in this year’s Giro d’Italia. The fight to get into the early break was dramatically intensified compared to that of the early stages in this year’s TDF. With a strong chance that the early break would succeed for a stage win (which it did) the start was very fast. 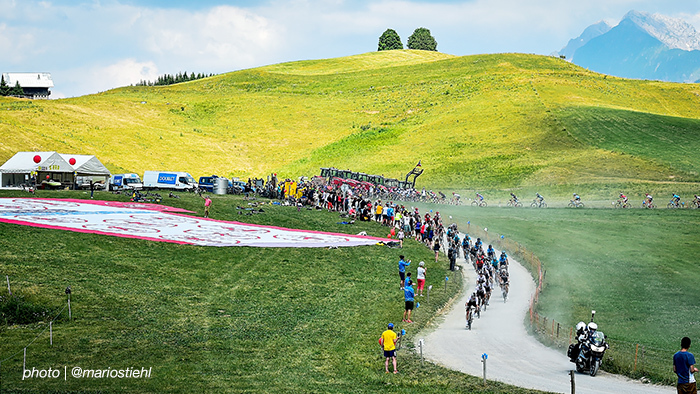 Today’s stage had two short climbs in the opening 19km, the second of which was rated category 4. The peloton rode extremely hard to the top of this climb in an attempt to keep the early break from getting clear. It was on these two short opening climbs in the opening 30min of racing that Mikel hit all his peak powers for 1,2,3,4 and 5min. This is an indication of how hard it was for Mikel, who was just keeping position within the peloton. On the first short climb he did 372w, 6.31 w/kg for 3:44min, and shortly after that (on the cat 4 climb) he produced 5min at 377w, 6.39w/kg. In other words, the pace was high, and this opening part of the stage would have put many riders into the red before they even reached the meat of the stage. Tom was part of the group of riders who played an active role in keeeping the tempo so high in the opening part of the stage. It was on these two short climbs that he forged ahead, helping a select group of around 20 riders break clear. Like Nieve, he set most of his short-term peak powers in the opening 20km of racing. One was on the first non-categorized climb, which he hit full gas after only 12km of racing. Here, he produced 458w, 7.82w/kg for 2:56min as he made a big effort to form a breakaway. Despite his enormous numbers, this first effort was not enough for the break to get clear. They continued their aggression onto the next short hill, where the elastic finally broke and the group was able to gap the peloton. This is a great insight into the actual power required just to get into a breakaway on a mountain stage at the Tour de France. The break had stretched the time gap to around 3min as they hit the first long climb of the day. But the peloton took the Cat 1 ascent at a relatively controlled pace, set as usual by the Team Sky train. They succeeded in keeping the break within range without working too hard. The consistent effort (around 5w/kg for Mikel) was easy enough to keep most of the peloton together, and I suspect this tempo did not put Mikel or his team leader under too much strain. After the long 18km descent off the Croix Fry, (during which the Peloton hit speeds of over 90kph), the riders tackled the hardest and steepest climb of the day. This was a new addition to the TDF, and a climb which is not widely known within the Professional cycling circuit. At 6km of length and with 2km of Gravel over the top, it made for some tremendous viewing. We saw much of the lead break start to splinter as they all tried to get into their own rhythm and hopefully keep within range of their fellow escapes over this climb. Behind in the peloton the pace was starting to ramp up, mainly due to the gradient and the effort needed to keep moving forward. Mikel kept his pace around the 5.3w/kg range, and rarely did he go over 6w/kg at any stage on this climb. His cadence, however, was greatly reduced to 75rpm. Little rhythm could be found on these slopes. On the climb of Montée du Plateau des Glières, the lead break (which Tom was part of) had nearly 7min on the chasing peloton. It was on the early parts of this climb that the 20-man group started to splinter, but Tom was able to keep the leading riders within reach, as he paced the climb with fellow Dutch rider Robert Gesink of LottoNL-Jumbo. On this climb Tom produced 344w, 5.82w/kg for 6km. The notable .5w/kg more he produced compared to that of Nieve, who was in the chasing peloton, was enough to make him nearly 3min quicker than Nieve. Tom’s effort was also enough to secure him a place in the front of the break as they hit the last two Cat 1 climbs of the day. The pace set on the last 2 climbs was notably higher than the other climbs, as the bunch neared the finish. With it looking more likely that the winner of the day was going to come from the leading break, the peloton (still led by Team Sky) was more concerned with nullifying potential GC attacks than chasing back the break. To do this Sky gradually ratcheted up the pace over these last two climbs, to keep the group on the rivet and make attacking feel impossible. In responding, Mikel set his peak powers for 12min at the bottom of the penultimate climb, Col de Romme, at 362w, 6.14w/kg. Then he set another peak power of 20min on the very last climb, the Col de la Colombière, when he did 355w, 6.02w.kg. It was on the slopes of the Col de la Colombière that many riders were put into difficulty, including last year’s 2nd place Rigoberto Uran. In the opening 2km of the climb Mikel rode at 365w, 6.19w/kg for 6min, which was enough to keep him at the head of the group and close to his team leader Adam Yates. Still, the pace did not let up, and riders faced a stiff headwind on the exposed slopes at the top of the climb. Here, Mikel was riding within a range of 5.9-6.1w/kg before reaching an average of 380w, 6.35w/kg right at the top of the climb. This increase of pace at the end of a maximal 22min effort would have been brutal, and a real test to see who was on form in the high mountains. By the finish, Mikel lost 15 seconds to the leading group of GC riders, likely on the descent to the finish at La Grand-Bonard. 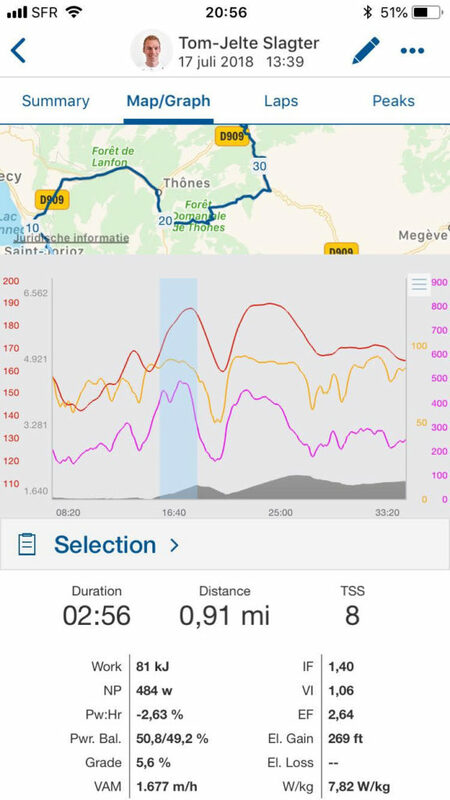 Still, the performance of both Mikel and his team leader Adam Yates is a clear indication that both riders are in good shape and ready for more aggressive racing as they head deeper into the mountains.